In December 2008, I wrote a review of my 2007 Moto Guzzi California Vintage based on the first 1000 miles that I owned it. I’m now at 3000 miles and figured it would be a good time for an update. Before I start, I want to mention that I believe there are no real differences between the model years of this motorcycle, at least through 2009, so this review should be pretty valid for all 4 model years of the Cal Vin. I purchased my 2007 Cali new during the later part of 2008. I don’t ride on any high mileage trips, just because of family and work obligations, so it has actually taken me about a year to accumulate these 3000 miles. I do realize that some folks ride that many miles in just days or weeks. My impression of the Moto Guzzi California Vintage has not changed over the past year. Yes, I still do love it and feel very lucky to own this motorcycle. I have had countless people ask me, in a very puzzled way, why I chose to buy a Moto Guzzi. I’ve also had many compliments about it, most coming from people that never heard of a Moto Guzzi before. Keep in mind that here in the USA, Moto Guzzi is not a well known brand unless you are talking to real motorcycle enthusiasts, or to those that remembers the Guzzis of the late 1960’s and early 1970’s that caught on in this part of the world, especially as police bikes. I usually explain that I discovered the Guzzi California several years ago and always had it on my wish-list. Honestly, I think the Jackal had been introduced, with a low introductory price, and there was an idea that I could almost afford a new Moto Guzzi although I never bought it. Of course, the engine and the entire motorcycle to me are like a mechanical art, but that’s just me. I actually had an Italian co-worker ask me if I am able to keep it running. Unfortunately, I don’t have any friends in Italy, so it’s hard for me to judge that remark. I guess some people say the same thing about Harley-Davidson motorcycles here in the US, so I didn’t give it much consideration. So far, I have no regrets about owning a Moto Guzzi, and no regrets about owning the California Vintage. Has anything gone wrong with hit? The only major thing to go wrong in the first 3000 miles is that I had a valve cover gasket leak. It was no real trouble to replace it myself, and the problem was solved for less than $20 US dollars. I wrote a “how to” about the changing the gasket with photos if anyone cares to see how that is done. I really do not expect this to be a common problem, and based on some forums I sometimes read, I don’t expect that it was the fault of the Moto Guzzi factory either. Most people try to reuse the valve cover gasket and get away with it, but sometimes it can get damaged if not re-installed very carefully. No harm was caused and the leak was caught within just a few minutes of when it began. Another strange occurrence during the first 3000 miles was that I found my tail light/brake light cable was disconnected under my seat. I don’t know how long I rode like that (yikes!) and I have no idea how that got disconnected. I simply reconnected it and used a nylon cable tie to secure it. The seat locks in place, and you have to use the ignition key to open it. Maybe I did it by accident when I was cleaning, who knows. That disconnected cable is additional proof that it really pays to do your T-CLOCS check, as taught in the MSF experienced rider course. If you never took a Motorcycle Safety Foundation course, you should get yourself signed up, no matter how many years you have been riding. I leaned a lot in the experienced rider course and I really do use what I learned there. Ok, enough about that, on with the review! The 1064cc fuel injected v-twin of the California Vintage has a nice healthy sound and a very good kind of vibration. Without the vibration or mild rumble, I don’t think it would be quite as thrilling to ride, but would still be good. If that sounds crazy to you, then a v-twin might not be your cup of tea. So, with this good kind of v-twin engine vibration comes a bit of care to make sure things are kept tight. I’m a mechanical engineer by trade, and for years I worked on impact wrenches and other tools that like to rattle themselves apart, so I am used to keeping an eye on fasteners. About the only loose fastener I did find was the large nut at the shift lever pivot (by your left ankle). The shifter started to develop a little extra side-to-side play in the foot lever and I simply tightened it back up. It was an easy task that required a hex wrench to hold the stud from rotating and an opened end wrench to torque the nut. I always check that now, but have never had to re-tighten it again so far. That happened at about 2300 miles. The only other thing that has happened is that one of the front wheel weights became a little loose, but didn’t fall off. I noticed this one day when I was cleaning the spokes. The weights have some sort of adhesive back that is supposed to keep them on the wheel and they have no other mechanical means to secure them. I was lucky that it did not come off when I was riding. I suppose that could happen on any motorcycle, or car for that matter. To me, the sound of the V11 engine as it hits 4000 rpm is something really special. The factory Lafranconi Italian-made exhaust system is quite good. It gives a substantial sound, but is not annoyingly loud. It has a good, mild sort of back-pressure popping cackle to it when you let off the throttle. I really like it because it is not screamingly loud. Obviously, some riders like their bikes really loud, but personally, I compare it to music., where at some point, the music no longer is enjoyable if you turn the volume up too high. I often can’t hear my bike when I ride with my Harley and Victory riding friends because of their loud aftermarket pipes, but the tachometer (standard on the Vintage) helps me make my shift points which I usually do by ear. Many riders like to customize their motorcycle. I was attracted to this Moto Guzzi California due to its looks, but also due to the fact it comes with so many practical features factory installed. For example, locking hard bags with chrome guards, chrome fog lights, chrome luggage rack, chrome engine guard, 12V accessory outlet, steering damper, tool kit, and more. The only accessory I installed so far is the Givi trunk that I wrote about previously. To that, I have since added the mating backrest pad from Givi to make it a little more comfortable for my young son, as he sometimes likes to lean back against the trunk when we go on our rides around town. Last, but not least, here in North Carolina, they require an annual safety inspection for motorcycles and cars. Unfortunately, my local Moto Guzzi dealer is not a state inspection station due to some crazy rules the state has about the facility layout, so I had to bring my Vintage to a different place for this. I chose the local BMW-Ducati-Triumph-MV Agusta dealer because they deal in European motorcycles. In fact, that criteria didn’t really matter since it was just an inspection, but it made me feel more comfortable. I’m happy to report all was well and it passed the state inspection with ease. I can now renew my registration and legally ride on for another year. Note from the author: As a follow-up to this 3000 mile review, which I originally published in October 2009, please see my Moto Guzzi California Vintage long term review. I published that update at approximately 8900 miles in June 2011. My Guzzi California journey continues! John Clay is the author of MotoGuzziCalifornia.Com. He and his family reside in North Carolina in the United States. A graduate of the Motorcycle Safety Foundation's Experienced Rider Course, he enjoys riding and maintaining his Moto Guzzi California Vintage. John participates in local charity rides and also served as a volunteer motorcycle marshal for one of the largest annual bicycle charity event in the Carolinas. To put an end to any lingering battery worries, I bought a Deltran Battery Tender Junior. 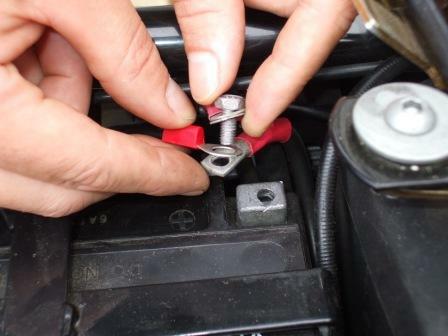 I love this gadget and wanted to share a few installation tips and photos of how I installed it on my Moto Guzzi California motorcycle. Moto Guzzi California Special replaced the Bassa in 2001, but even with it’s short few years of existence, the Bassa name continues to hold a special place in the history and evolution of the Guzzi California. A top case on a Moto Guzzi California can also serve as a passenger back rest, and you can add a pad to the top case to make it a little nicer for your passenger. Robert, only 17,338 miles so far and this motorcycle is still a real gem for me. Mostly just commuting to work, but very satisfied. Aside from some occasional front brake pulsation that could be warped rotors or perhaps dirty rivets that locate the rotors, there is actually nothing negative to report, thankfully. Reliability has been great, just as I anticipated when I bought it new because it is a tried and true design based on many years of incremental improvements. It is not a good match for anyone that wants an ultra-modern bike, but it is really a perfect motorcycle for me and for anyone that appreciates a pure motorcycle and it’s mechanical nature. Now that you got me thinking about it, I’ll work on writing a more complete update of my California Vintage ownership experience soon. Thanks for asking! Great review! 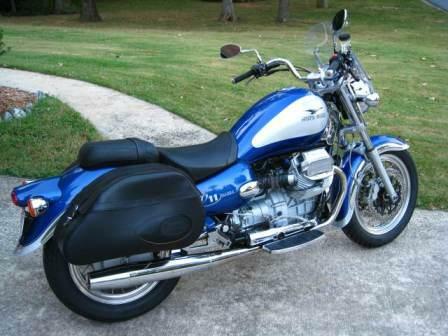 Have owned 3 Guzzi’s still have 2 cali’s 2000 model with 68000 on it very sweet machine am looking to add a vintage. i have had several bikes before and since buying the Guzzi’s but I keep coming back to them, and yes I have owned several Harley’s and put over 1.2 million miles on them while testing and at the end of every day how sweet it was to swing my leg over my Guzzi and ride the 75 miles home. I’m hooked anyone want to trade a Vintage for a 2010 Triumph America tour model?? I should add that I bought stainless steel locking nuts. Regarding the shift lever pivot nut loosening, I had the same problem but didn’t catch it until the nut backed off and I couldn’t shift. I was only about a mile from home so it was no problem. I went to my local NAPA store and bought a few 6mm nuts with the nylon insert. I replaced all the nuts I could find and have had no more problems. I’ve now done nearly 7000 miles on a Vintage California I bought this time last year (South Shields, UK). Included 2600 down to south of France. I really like the bike but agree it has to be revved to enjoy properly. I like to ride with well inserted earplugs so all I hear is the thump of the exhausts, and not the fairly noisy tappets. Had a couple of problems. The left rocker box cover keeps leaking – as you’ve referred to. I think I may have solved it but it does have a habit of recurring unexpectedly. The other thing is that the tail light assembly shattered, presumably due to vibration. All repaired under warranty without quibble. Anyhow I’m intending to hang on to this bike (also have an FJR1300 for longer two up touring) for a few years and it’ll be interesting to watch out for your ongoing experiences.